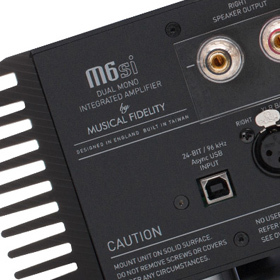 Erich said: The M6si’s sound never drew attention to itself, handling all types of music with aplomb, and its performance was evenhanded at any listening level. I enjoyed listening to it because its sound produced no stress in me. That’s how the experience of listening to music should feel, but often doesn't. The M6si struck just the right balance. The gist: Flexible, powerful integrated with very nice sound.